*Please call the restaurant for Easter reservations. Emails & OffersReceive updates on special events, new menu items, menu reviews, and more! CHICKEN WINGS GOLDEN FRIED AND TOSSED WITH A CHOICE OF HOUSEMADE MAPLE BBQ, CLASSIC BUFFALO OR GARLIC PARMESAN SAUCE. CHILLED SUSHI-GRADE YELLOWFIN TUNA, SERVED RARE WITH ASIAN SLAW, SWEET TERIYAKI AND A SRIRACHA AIOLI DRIZZLE. A CREAMY BLEND OF CHEESES, SPINACH AND ARTICHOKES, SERVED IN A SOURDOUGH BREAD BOWL WITH TORTILLA CHIPS AND CUCUMBER SLICES. CRISPY DILL PICKLE CHIPS, SERVED WITH HONEY MUSTARD AND SRIRACHA AIOLI DIPPING SAUCES. LAYERS OF CORN TORTILLA CHIPS, PULLED BBQ CHICKEN, BLACK BEANS, CORN, NACHO CHEESE SAUCE, BBQ SAUCE, RANCH AND BANANA PEPPERS. A CREAMY BLEND OF CRAB, CHEESES AND SCALLIONS, BAKED WITH WHITE CHEDDAR AND SERVED WITH OLD BAY SEASONED POTATO CHIPS, WARMED NAAN AND CELERY. FRIED TATER TOTS TOPPED WITH CHORIZO SAUSAGE, NACHO CHEESE SAUCE, FRESH PICO DE GALLO, AVOCADO, SOUR CREAM AND SCALLIONS. GOLDEN FRIED RINGS, TENTACLES AND CHERRY PEPPERS, FINISHED WITH A SWEET CHILI SAUCE. TEMPURA BATTERED AND LIGHTLY FRIED SHRIMP, TOSSED IN A SWEET CHILI SAUCE. A MEDLEY OF RED PEPPER HUMMUS, WALNUT ENCRUSTED GOAT CHEESE, BLUE CHEESE, GRAPES, FIG JAM, PEPPERONI, PICKLES AND CUCUMBERS, WITH AN ARTICHOKE, TOMATO AND FETA SALAD, ACCOMPANIED BY CIABATTA AND NAAN. SHREDDED CHICKEN AND BLUE CHEESE, TOPPED WITH CHEDDAR AND FINISHED WITH A DRIZZLE OF RANCH AND BUFFALO. POMODORO SAUCE TOPPED WITH PEPPERONI, CHERRY PEPPERS, A PROVOLONE AND MOZZARELLA BLEND, FRESH MOZZARELLA AND PARSLEY. PESTO, SHREDDED BRAISED SHORT RIBS, CARAMELIZED ONIONS, ROASTED TOMATOES AND WHITE CHEDDAR, FINISHED WITH ARUGULA AND A HORSERADISH TRUFFLE CREAM. PESTO, SLICED TOMATOES AND FRESH MOZZARELLA, FINISHED WITH A BALSAMIC REDUCTION AND BASIL. ARTISAN GREENS AND ARUGULA, DICED GALA APPLES, RED GRAPES AND CANDIED WALNUTS, TOSSED IN A BALSAMIC VINAIGRETTE, TOPPED WITH FETA AND APPLEWOOD SMOKED BACON. 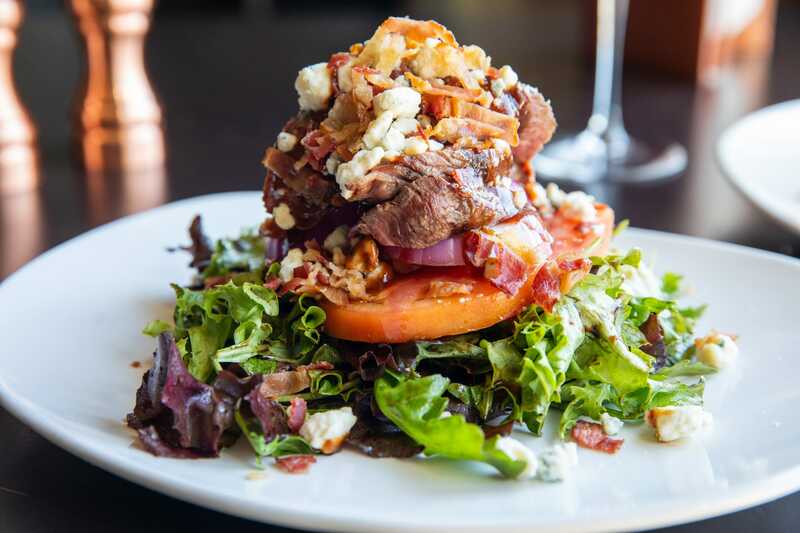 THICK SLICED BEEFSTEAK TOMATO AND RED ONION, STACKED WITH ARTISAN GREENS AND SIRLOIN STEAK, FINISHED WITH HOUSEMADE STEAK SAUCE, BLUE CHEESE CRUMBLES, APPLEWOOD SMOKED BACON AND A BALSAMIC REDUCTION. CRISP ROMAINE HEARTS AND HOUSEMADE SEASONED CROUTONS, TOSSED IN A HOUSEMADE CAESAR DRESSING AND TOPPED WITH SHAVED REGGIANO. SHREDDED KALE, BRUSSELS SPROUTS, BROCCOLI, CABBAGE, RADICCHIO, CARROTS AND GOLDEN BEETS WITH ARUGULA, DRIED CRANBERRIES AND PECANS, TOSSED IN A WHOLE GRAIN MUSTARD VINAIGRETTE, TOPPED WITH GOAT CHEESE AND GRANNY SMITH APPLES. MARINATED AND ROASTED PURPLE AND GOLDEN BEETS TOSSED WITH ARUGULA, PICKLED ONIONS, CANDIED WALNUTS AND A RED WINE VINAIGRETTE, FINISHED WITH CRUMBLED GOAT CHEESE. ICEBERG WEDGE SERVED WITH APPLEWOOD SMOKED BACON, BLUE CHEESE CRUMBLES, GRAPE TOMATOES, RED ONIONS, HOUSEMADE BLUE CHEESE DRESSING AND A BALSAMIC REDUCTION. A RICH BEEF BROTH ONION SOUP WITH A HINT OF BRANDY AND FRESH HERBS, FINISHED WITH CROUTONS, A MELTED SWISS AND PARMESAN BLEND. A MILDLY SWEET CREAM OF TOMATO SOUP WITH A HINT OF GARLIC AND PARMESAN. GRILLED 8 OZ ALL-NATURAL Certified Angus Beef ® BURGER, SERVED WITH YOUR CHOICE OF CHEESE, LETTUCE, TOMATO, RED ONION AND PICKLE, SERVED ON A BRIOCHE BUN. PAN-SEARED TURKEY BURGER SERVED ON AN HERBED FOCACCIA BUN AND TOPPED WITH GOAT CHEESE, CRANBERRY AIOLI, CARAMELIZED ONIONS AND APPLES. SLOW COOKED PULLED PORK, SLICED HAM, SWISS CHEESE, HONEY MUSTARD AND FRIED PICKLES GRILLED ON THICK CIABATTA. LIGHTLY FRIED OR GRILLED CHICKEN TOPPED WITH SWISS, SHAVED HAM, HONEY MUSTARD, LEAF LETTUCE AND TOMATO, SERVED ON A PRETZEL BUN. GRILLED 8 OZ ALL-NATURAL Certified Angus Beef ® BURGER, AMERICAN CHEESE, APPLEWOOD SMOKED BACON, FRIED EGG, SMASHED TATER TOTS AND CARAMELIZED SHALLOT DEMI-GLACE, SERVED ON A BRIOCHE BUN. A CAJUN-SEARED SALMON BURGER, SERVED ON A BRIOCHE BUN WITH ARTISAN MIX, ASIAN SLAW AND SRIRACHA AIOLI. Certified Angus Beef ® SHAVED STEAK, CARAMELIZED ONIONS, GREEN AND RED PEPPERS, SMOTHERED WITH AMERICAN CHEESE, SERVED IN A CRUSTY SUB ROLL. SLOW COOKED PULLED PORK, TOSSED IN BBQ, SERVED ON A PRETZEL BUN WITH COLESLAW, PICKLES, CHEDDAR AND CRISPY ONION STRINGS. SLICED CAJUN TUNA, SERVED RARE, OVER JASMINE RICE WITH AVOCADO, SHAVED CUCUMBER AND HONEYDEW MELON, FINISHED WITH SOY GINGER DRESSING. SAUTÉED CHICKEN BREAST TOSSED WITH PESTO CREAM SAUCE, ROASTED TOMATOES, ARTICHOKES AND TAGLIATELLE, TOPPED WITH PARMESAN. PAN-SEARED SALMON OVER CHILLED SOBA NOODLES, TOSSED WITH ASIAN SLAW AND SESAME GINGER DRESSING, TOPPED WITH SESAME SEEDS AND SRIRACHA AIOLI. SLOW ROASTED SHORT RIBS, SERVED OVER AN ASPARAGUS AND PARMESAN RISOTTO, FINISHED WITH A RED WINE AU JUS AND TOPPED WITH FRIED LEEKS. A MIXTURE OF GROUND BEEF, PORK AND VEAL WITH A SMOKY GLAZE, SERVED OVER ROASTED GARLIC MASHED POTATOES AND BROCCOLI, TOPPED WITH CRISPY ONION STRINGS AND SRIRACHA KETCHUP. GRILLED SIRLOIN OVER MASHED POTATOES AND ROASTED BRUSSELS SPROUTS, TOPPED WITH SAUTÉED MUSHROOMS AND A CARAMELIZED SHALLOT DEMI-GLACE. NORTH ATLANTIC COD FRIED IN SEASONED FLOUR, SERVED WITH FRENCH FRIES, ACCOMPANIED BY TARTAR SAUCE AND COLESLAW. CAJUN SEASONED SIRLOIN STEAK TOPPED WITH AN HERB AND GARLIC INFUSED CHIMICHURRI SAUCE, SERVED WITH SEASONED FRENCH FRIES. SAUTÉED SHRIMP TOSSED IN AN HERBED CLAM SAUCE WITH ROASTED TOMATOES AND LINGUINI, FINISHED WITH BASIL, PARMESAN AND GRILLED CIABATTA. BLACKENED SWORDFISH SERVED OVER A BLACK BEAN, CORN AND RICE SALAD, BLACK BEAN PUREE AND ARUGULA, TOSSED IN CITRUS OIL AND FINISHED WITH LIME SOUR CREAM AND GRILLED CITRUS. GOLDEN FRIED CHICKEN BREAST TOPPED WITH PESTO, REGGIANO, MOZZARELLA AND ROASTED TOMATOES, FINISHED WITH A BALSAMIC REDUCTION, SERVED WITH AN ARTISAN GREEN SALAD. A RICH CHEESE SAUCE TOSSED WITH CAVATAPPI PASTA, TOPPED WITH BBQ PULLED PORK, ONION STRINGS AND CRACKER CRUMBLES, FINISHED WITH BBQ AND RANCH. LIGHTLY FRIED CHICKEN SERVED WITH SAUTÉED GNOCCHI AND SPINACH, TOSSED IN A LEMON CAPER PARMESAN BUTTER SAUCE WITH FRIED SAGE. PAN-SEARED BEEF TENDERLOIN WITH A WILD MUSHROOM BLEND, CARAMELIZED ONIONS AND A RICH, SALTED DEMI-GLACE, SERVED WITH CRISPY HERB SPÄTZLE. NORTH ATLANTIC, OCEANIC RAISED. PREPARED GRILLED OR CAJUN STYLE. NORTH ATLANTIC, LINE CAUGHT. BAKED WITH A LEMON CRACKER GREMOLATA. EAST COAST, LINE CAUGHT. PREPARED GRILLED OR CAJUN STYLE. 12 OZ OF BOURBON MARINATED TIPS, FINISHED WITH A WHISKEY GLAZE. 14 OZ, 28 DAY AGED, BRUSHED WITH A BALSAMIC BBQ COMPOUND BUTTER. 12 OZ, 28 DAY AGED, BRUSHED WITH A STEAKHOUSE BUTTER. BROCCOLI, MUSHROOMS, GREEN AND RED PEPPERS, TOSSED WITH CAVATAPPI PASTA IN A TOMATO CREAM SAUCE, TOPPED WITH SHAVED PARMESAN. AVAILABLE VEGAN UPON REQUEST. A BLEND OF GOAT AND AMERICAN CHEESE ON GRIDDLED CIABATTA WITH ROASTED GARLIC AIOLI, ACCOMPANIED BY A MILDLY SWEET CREAM OF TOMATO SOUP. 100% PLANT BASED BURGER SERVED ON A BRIOCHE BUN WITH GARLIC AIOLI, TOPPED WITH A CHOICE OF CHEESE, LETTUCE, TOMATO AND RED ONION, ACCOMPANIED BY A PICKLE AND THE CHOICE OF ONE SIDE. AVAILABLE VEGAN UPON REQUEST. SAUTÉED LINGUINI NOODLES TOSSED IN HOISIN TERIYAKI WITH BROCCOLI, CARROTS, CUCUMBERS AND RED PEPPERS, FINISHED WITH A SRIRACHA AIOLI DRIZZLE. AVAILABLE VEGAN UPON REQUEST. RED PEPPER HUMMUS, RED ONION, FETA, ROASTED RED PEPPERS, SLICED OLIVES, SHAVED CUCUMBER AND ARUGULA, WRAPPED IN A WARMED NAAN. AVAILABLE VEGAN UPON REQUEST. ROASTED TOMATOES, ARTICHOKES AND CAVATAPPI PASTA, TOSSED IN A CREAMY PESTO SAUCE AND FINISHED WITH SHAVED REGGIANO. Here at 110 Grill, we pride ourselves on our commitment to accommodating all guests’ allergen needs. We do this through preparing dishes to order in our scratch kitchens, utilizing allergen picks and only having management deliver allergy-safe dishes. Our management teams have current certifications for Food Safety and Allergen Awareness, and all employees receive extensive allergy awareness training to ensure guest safety. 100% of our core menus are either naturally gluten free or can be modified to be. Please ask your server for a separate gluten free menu. Visit us every Monday and earn 2 loyalty points for every $1 spent on food & non-alcoholic beverages. You will earn your $10 reward twice as fast! Ask your server for details. Receive one complimentary kid's meal per adult entree purchased. Dine in only, no takeout. Cannot combine with any other offers or promotions. Complimentary kid's meal is from the children's menu only. Mention or show this promo to receive the discount.